Xico volcano sits at the extreme southern end of the Mexico City megalopolis. For a geologically significant chunk of time, this area was underwater, drowned by Lake Chalco. 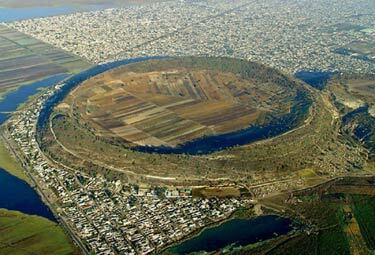 The lake began to dry out in the 1300s, and Aztec fishermen settled along its coastline hereabouts. In the nineteenth century, the government drained the lake entirely; the fishermen were awarded communal land grants and told to become farmers. Farming became intensive in the 1970s, when corporate agriculturists and desperate landless peasants struck illegal or quasi-legal deals with the communal organizations and wrested control of the rich volcanic soil. Thousands and thousands of families poured into the region, hoping for work. Farmers climbed over the rim of the volcano and plowed fields inside the crater. Xico the town sprawled right up to the ramparts of Xico the crater and appears likely to soon engulf it; in 2005, the population of the municipality was 330,000. Hat tip to Ratak Monodosico. the Archives of Never Yet Melted in the 'Craters' Category.